^ Staff (January 2004). “Horror Movie Licenses”. Retro Gamer (1): 71. Kenneth Muir, John (2004). 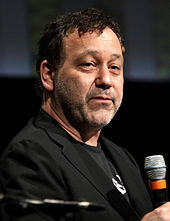 The Unseen Force: the Films of Sam Raimi. Applause Theatre & Cinema Books. ISBN 978-1-55783-607-6. Eddie, Robson (2010). Coen Brothers (Virgin Film). Virgin Books. ISBN 978-0-7535-1268-5. Kenneth Muir, John (2007). Horror Films of the 1980s. Virgin Books. ISBN 978-0-7864-2821-2. Pooley, Eric (1987). Warped in America: The Dark Visions of Joel and Ethan Coen. New York. ISBN 978-0-7864-2821-2. Warren, Bill (2000). The Evil Dead Companion. Titan Books. ISBN 1-84023-187-4. R. Collings, Michael (2008). The Films of Stephen King: From Carrie to Secret Window. Palgrave Macmillan. ISBN 978-0-230-60131-4. Egan, Kate (2011). The Evil Dead. Wallflower Press. ISBN 978-1-906660-34-5. R Collings, Michael (2007). Scaring Us to Death: The Impact of Stephen King on Popular Culture. Borgo Press. ISBN 978-0-930261-37-5. Kerekes, David (2000). See No Evil: Banned Films and Video Controversy. Critical Vision. ISBN 978-1-900486-10-1. Hantke, Steffen (2004). University Press of Mississippi. Critical Vision. ISBN 978-1-57806-692-6. Xavier, Mendik (2004). Alternative Europe: Eurotrash and Exploitation Cinema Since 1945. Wallflower Press. ISBN 978-1-903364-93-2. F. Kawin, Bruce (2012). Horror and the Horror Film (New Perspectives on World Cinema). Anthem Press. ISBN 978-0-85728-450-1. Staiger, Janet (2005). Media Reception Studies. NYU Press. ISBN 978-0-8147-8135-7. Finney, Angus (1997). The Egos Have Landed: Rise and Fall of Palace Pictures. Arrow Books Ltd. ISBN 978-0-7493-1946-5. Chibnall, Steve (2001). British Horror Cinema. Routledge. ISBN 978-0-415-23004-9. Newman, Kim (2011). Nightmare Movies: Horror on Screen Since the 1960s. Bloomsbury Publishing. ISBN 978-1-4088-0503-9. Schofield Clark, Lynn (2005). From Angels to Aliens: Teenagers, the Media, and the Supernatural. Oxford University Press. ISBN 978-0-19-530023-9. Summer, Don (2007). Horror Movie Freak. Unknown Binding. ASIN B004434G7M. Žižek, Slavoj (2000). The Ticklish Subject: The Absent Centre of Political Ontology. Verso. ISBN 978-1-85984-291-1. Paul, Louis (2007). Tales from the Cult Film Trenches: Interviews with 36 Actors from Horror, Science Fiction and Exploitation Cinema. McFarland & Company. ISBN 978-0-7864-2994-3. Harris, J. P. Harris (2002). Time Capsule: Reviews of horror, science fiction and fantasy films and TV shows from 1987 to 1991. iUniverse. ISBN 978-0-595-21336-8. Lavery, David (2009). The Essential Cult TV Reader (Essential Readers in Contemporary Media). The University Press of Kentucky. ISBN 978-0-8131-2568-8. Lowry, Brian (1995). The Truth is Out There: The Official Guide to the X-Files. Harper Prism 5. ISBN 978-0-06-105330-6. Kay, Glenn (2008). Zombie Movies: The Ultimate Guide. Chicago Review Press. ISBN 978-1-55652-770-8. Konow, David Konow (2008). Reel Terror: The Scary, Bloody, Gory, Hundred-Year History of Classic Horror Films. St. Martin's Press. ISBN 0-312-66883-X.